ORIGINAL HAND SIGNED RECORD ALBUM COVER. JSA IS HIGHLY RESPECTED IN THE AUTHENTICATION INDUSTRY. TOGETHER WITH 2 JIM SHOOTER SIGNED. (SEE PHOTO OF JIM SIGNING THE LOA'S). JIM SHOOTER THEN EDITOR-IN-CHIEF AT MARVEL. GOT STEVE DITKO TO SIGN AND OK THIS. PIECE FOR THE BARNES GUYS TO USE FOR THIS ALBUM COVER. SIGNED IN 1984 BY STEVE DITKO! 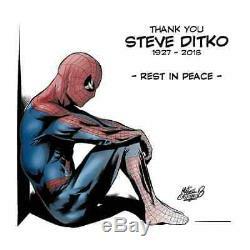 COULD THIS BE THE ONLY STEVE DITKO SIGNED 100% AUTHENTIC PERSONALIZED ITEM OF MEMORABILIA OUT THERE? 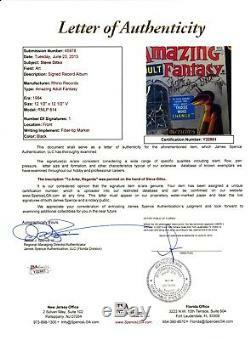 ORIGINAL STAN LEE SIGNED RECORD ALBUM COVER. WITH STAN LEE MATCHING COA CERTIFICATE. FORMER EDITOR-IN-CHIEF OF MARVEL COMICS. DRAWN BY THE AMAZINGLY TALENTED STEVE DITKO. WITNESSED AND AUTHENTICATED BY CGC. THIS BOOK CARRIES THE CGC SS YELLOW SIGNATURE SERIES. NEW ITEMS LISTED ALL THE TIME! VERY RARE AND HIGHLY COLLECTIBLE STEVE DITKO. 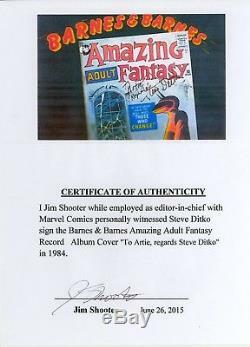 THE ONLY 100% AUTHENTICATED PERSONALIZED STEVE DITKO SIGNATURE ON A COLLECTIBLE TYPE OF INVESTMENT MEMORABILIA THAT I HAVE SEEN. THIS STEVE DITKO SIGNATURE WAS AUTHENTICATED BY. A VERY HIGHLY RESPECTED AUTHENTICATION COMPANY! I WROTE STEVE DITKO A LETTER ABOUT THIS ITEM AND HE DID RESPOND! SINCE THIS LETTER WAS TO ME PERSONALLY AND HE RESPONDED TO MY QUESTIONS I HAVE DECIDED TO KEEP THE LETTER AS A PERSONAL POINT OF CONTACT WITH MR. DITKO AND ALL OF HIS WORK! THIS ISSUE PREDATES THE FIRST APPEARANCE OF SPIDER-MAN IN AMAZING FANTASY 15! CHANGED IT'S NAME TO. PLEASE NOTE THAT I DO NOT KNOW THE GRADING PROCEDURES FOR RECORD ALBUMS... I CAN SAY THAT THERE IS A GREAT GLOSS TO BOTH RECORD ALBUM COVERS. PLEASE SEE THE PICTURES FOR FURTHER EXAMINING OF BOTH ALBUM COVERS AND ALL AUTHENTICATIONS FOR THE ITEMS LISTED IN THIS LOT. I ACQUIRED THE STEVE DITKO SIGNED BARNES & BARNES RECORD ALBUM COVER FIRST (NO RECORD) AND THEN I BOUGHT ANOTHER BARNES & BARNES RECORD ALBUM COVER (WITH RECORD) TO HAVE STAN LEE SIGN IT. SO NOW, THE SET IS COMPLETE! THIS LOT REPRESENTS EVERYONE AT MARVEL COMICS THAT WAS. INVOLVED WITH THE SIGNING OF THIS ONE OF A KIND AND MUSEUM QUALITY STEVE DITKO HAND SIGNED BARNES & BARNES RECORD ALBUM COVER. Just a little history on the Steve Ditko hand signed. One of the Barnes guys is known as ART BARNES. That's really superstar Billy Mumy (of LOST IN SPACE). Well, this cover was signed to Mumy's partner "ARTIE BARNES". This item was rediscovered in Artie's vast archive of cool personal stuff and Barnes & Barnes rarities that he is custodian of. But for the right price he did part with it (to me). So, given the cool factor AND rarity of a STEVE DITKO hand signed autograph, on a Barnes & Barnes album cover featuring a comic book cover from 1962 that STEVE DITKO drew, well, how much better does it get than this? The autograph on this Barnes & Barnes album cover was obtained by then Editor-In-Chief of MARVEL COMICS, JIM SHOOTER. Only a guy like Jim could have gotten Steve to sign AND OK this piece for the Barnes guys to use for this album cover. As for Steve Ditko giving autographs I know. It was a very rare thing! It may actually be unheard of other than this particular case. If he chose to respond to someone's letter he signed it. Because at the end of a letter that's what you do. That's not really an "autograph" though. I personally have never seen and don't know of any other examples of him autographing a comic or anything else with his work on it. They could be out there... But I haven't ever seen them. THIS IS A BEAUTIFUL LOT AND SHOWS VERY, VERY WELL! THE WINNER WILL RECEIVE THE EXACT ITEMS PICTURED ABOVE! TAKE A GOOD LOOK AT THE PICTURES... A MUST HAVE FOR THE TRUE COLLECTOR AND A GREAT INVESTMENT IN THE MARVEL UNIVERSE! SUPER RARE AND SUPER COOL! Someone MUST be there to sign for these items!! I will be listing many more unique Comic Books in the near future. (coming from a non-smoking environment). 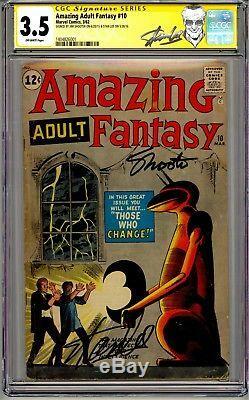 The item "STEVE DITKO SIGNED ALBUM COVER STAN LEE JIM SHOOTER AMAZING ADULT FANTASY CGC SS" is in sale since Wednesday, August 1, 2018. This item is in the category "Collectibles\Comics\Silver Age (1956-69)\Superhero\Spider-Man". The seller is "stockdoc777" and is located in Boca Raton, Florida. This item can be shipped to United States.